Apple Blossom Time by Marlene Bonneville - " x "
Apple Blossom Time metal print by Marlene Bonneville. Bring your artwork to life with the stylish lines and added depth of a metal print. Your image gets printed directly onto a sheet of 1/16" thick aluminum. The aluminum sheet is offset from the wall by a 3/4" thick wooden frame which is attached to the back. The high gloss of the aluminum sheet complements the rich colors of any image to produce stunning results. 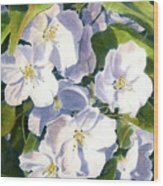 There are no comments for Apple Blossom Time. Click here to post the first comment. 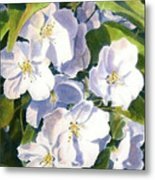 This is a watercolor painting of apple blossoms in the springtime. I'm a self-taught artist, originally from Northern Minnesota, but have been an Arizona resident for the last 36 years. I have been drawing and painting for my whole life. My style is mainly realism. I love to draw and paint birds, animals, landscapes, still life and the desert cactus flowers! I have studied Graphic Design and have been an art instructor for many years. I currently teach for a very active art club in Sun City, AZ.